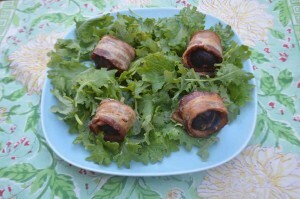 This fig appetizer stuffed with goat cheese and wrapped with bacon makes an amazing appetizer. It has a nice combination of flavors and textures. It has the sweetness of the figs and the saltiness of the bacon. The bacon is crispy and the goat cheese is creamy. 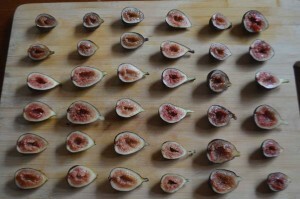 This fig appetizer is perfect if you are going to a party or a potluck. This Fig Appetizer with Goat Cheese and Bacon makes an amazing appetizer. It has a nice combination of flavors and is perfect for a party or pot luck. Cut the figs in half. Scoop out a small circle in the center of each half fig. Cook the bacon so it is cooked all the way but not crispy. 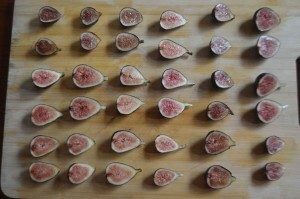 Put the two halves of the figs together. Bake in the oven for 7-8 minutes. 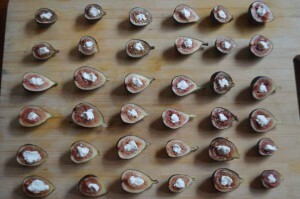 This Fig Appetizer with Goat Cheese and Bacon makes an amazing appetizer. This Fig Appetizer has a nice combination of flavors and textures. It has the sweetness of the figs and the saltiness of the bacon. The bacon is crispy and the goat cheese is creamy. Many people have allergies to cow’s dairy but are able to tolerate dairy from goats. I recommend using bacon without nitrates.